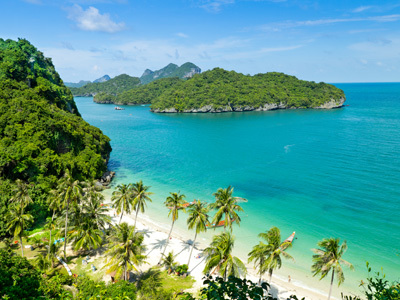 Experience the classic highlights of Thailand with a custom itinerary enabling you to see as much as you can during your stay. Your adventure begins with a visit to bustling city of Bangkok for an introduction of the city's most famous temples and sites. You'll continue on to the northern region of Chiang Mai where you'll have the opportunity to learn the art of Thai cuisine in the home of a local family and enjoy a full day elephant encounter experience at the highly regarded Patara Elephant Farm. End your amazing journey with some island hopping splitting your time between the famous beaches of Koh Phangan and Koh Samui. This morning, after breakfast, meet your private guide for a half-day exploration of Bangkok. First visit the Grand Palace, where an English governess once tutored a young prince and may have influenced his powerful father. The highlight of this mind-and-eye boggling palace is the Temple of the Emerald Buddha (Wat Pra Kaew), the most revered shrine in the Kingdom. 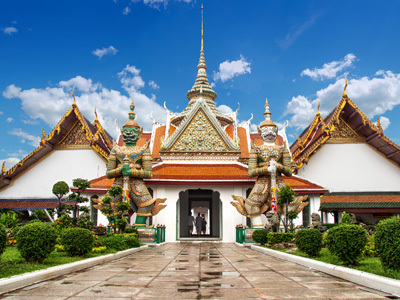 Located next to the Grand Palace is Wat Po, one of Bangkok’s oldest and largest temples. 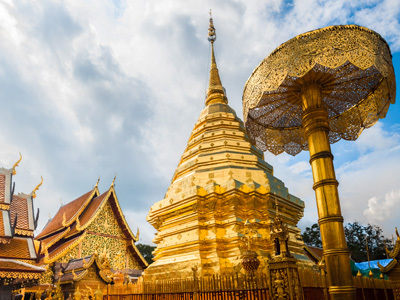 Visit this temple; housing the gigantic gold-plated Reclining Buddha. It is also the headquarters for the Traditional Medicine Practitioners of Bangkok. Then take a water taxi to Wat Arun, the Temple of Dawn. This is one of the best-known temples in Bangkok and dates back to the ancient Ayutthaya period. The tall, elongated central Khmer-style tower is surrounded by four minor towers, symbolizing Mount Meru, the earthly representation of the thirty-three heavens. Here, you'll find pavilions containing statues of the Buddha at the most important stages of life. The beautiful architecture and fine craftsmanship mark Wat Arun as one of the most remarkable temples in Thailand. Bright and early this morning, your guide will meet you at the hotel around 7:00 AM to embark on the 2 hour journey to the ancient capital of Ayutthaya. Ayutthaya was the capital of Siam from the 15th to the 18th century, when it was destroyed by the invading Burmese. The Thais then moved their capital to Bangkok (Krung Thep) in the 1770’s. Known as the center of distinctive art and architecture, Ayutthaya preceded modern Thailand, and is still known for its flourishing artistic community. Ayutthaya-period Buddhas are still some of the most treasured in the land. This morning at 9:00 AM you will be transferred to a local village to meet with a Raunkaew-Yanon family, who arrived in the area possibly on the back of an elephant, almost 150 years ago. They are a Lanna family, continuing the traditions of many generations in building their homes of teak wood and maintaining the natural surroundings in a way now rarely seen in Chiang Mai. 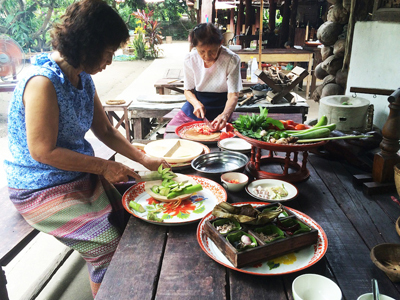 Of course this is not your average commercial cooking class as you will learn more about their culture, the way of living and the architecture of a traditional Thai house and rice barn. In the afternoon, you will be picked up at the airport in Koh Samui and transferred to the pier for your speedboat transfer to your hotel in Koh Phangan. 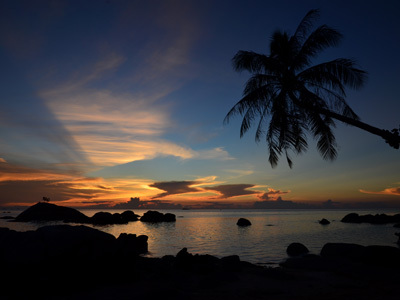 Globally renowned for its famous “Full Moon” festivities, Koh Phangan is also home to isolated hideaways offering tranquility and abundant natural beauty. The quiet and more remote northern region of the island creates a feeling of paradise with lush tropical forests, crystal clear bays and white sand beaches. In the morning, you will be picked up at your hotel in Koh Phangan and transferred to the pier for your speedboat transfer to your hotel in Koh Samui. 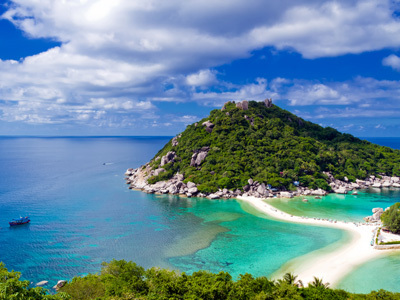 Koh Samui, or simply, Samui, as it is referred to by locals, is an island off the east coast of the Gulf Thailand. The island boasts beautiful white sand beaches, tropical foliage, hidden coves, rocky outcrops, and swaying palms. 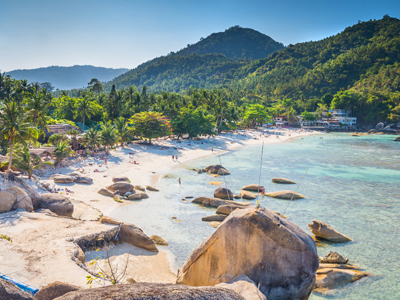 An eclectic array of spas; activity centers; resorts; world-class restaurants; beach bars, and a colorful mix of residents and tourists help you begin to understand the unique charm of Koh Samui. Upon arrival at the airport in Bangkok you will connect with your international flight onward. Situated along the enchanting Chao Phraya River, the Riva Surya Bangkok offers an idyllic urban getaway in the heart of this cosmopolitan capital city. This modern boutique hotel in Bangkok features 68 beautifully designed rooms, elegant dining options, a riverside swimming pool and leisure facilities that cater to the needs of all travelers. The property is the perfect base from which to explore the city's cultural treasures and lively entertainment districts, all within easy reach. The accommodating and friendly staff will ensure that all of your needs are met, from the moment you arrive, to the moment you depart. Hidden amidst swaying palm trees on a secluded white sandy beach with clear turquoise water, you will find Buri Rasa Village. 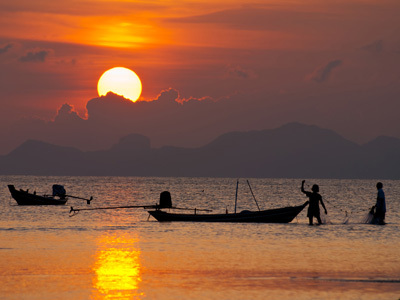 Experience tranquility and the natural beauty of Koh Phangan complimented by friendly personalized service that will make your holiday an experience to be remembered. 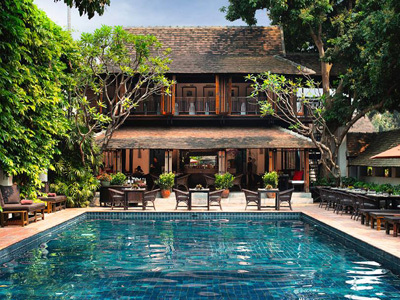 Enchanting traditional southern Thai dwellings in a Garden of Eden. Echoes of halcyon days with once upon a time tales of aristocracy escaping to country or paradise island retreats with a full compliment of servants and services to meet their every need & requirement. At Buri Rasa Village, relax by an outdoor pool or hit the beach where you can enjoy swimming. Guestrooms open to furnished balconies or patios with garden views and feature LCD televisions with premium cable channels. Other amenities include complimentary wireless Internet access and sofa beds.